Dry eye syndrome is a common condition that occurs when your eyes don’t make enough tears, or your tears evaporate too quickly. This leads to your eyes drying out and becoming red, swollen and irritated. Symptoms usually affect both eyes and often include a feeling of grittiness, soreness, eyelids that stick together when you wake up and visual disturbances. Some people may also experience watery eyes, as the eyes try to relieve the irritation by producing more tears. So, what causes Dry Eye Syndrome? Dry eye syndrome happens when the process of tear production is disrupted in some way. This can be caused by a number of everyday things, like being in a hot or windy climate, being around cigarette smoke, staring at a computer screen or just being tired. Other possible causes include wearing contact lenses, underlying medical conditions such as blepharitis as well as hormonal changes in women such as the menopause. Certain medicines can also cause dry eyes as a side effect. These can include acne medication, antihistamines, antidepressants, beta-blockers and diuretics. If you think that your medications are the cause of your dry eyes, then it is important that you don’t stop taking them without speaking to your doctor first. Depending on your health and the medication you take, your doctor may decide to lower the strength of the medication, switch to a different drug or recommend using eye drops to help the symptoms. Dry eye syndrome isn’t usually a serious condition, but if you have persistent symptoms then you should see your optician so they can examine you to check if the problem is caused by an underlying condition, or they may refer you to an eye specialist. 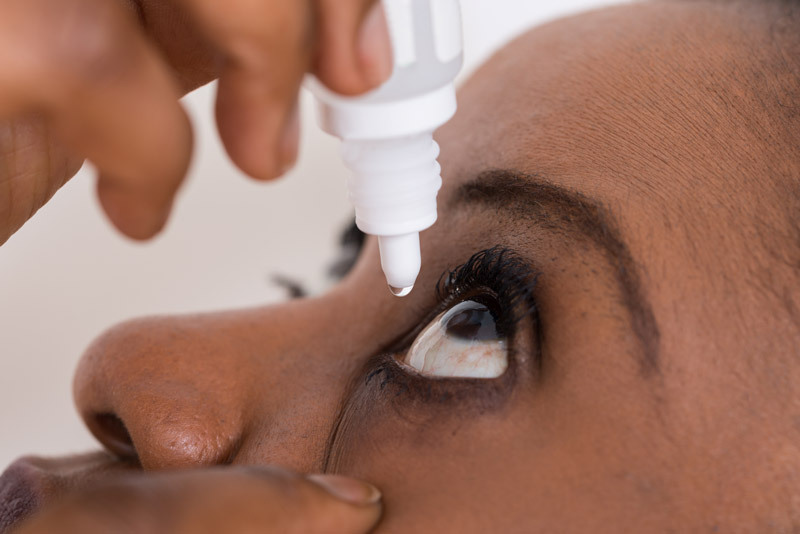 Treatments available to help relieve the symptoms of dry eyes include eye drops to help lubricate and soothe the eyes. In addition, there are some things you can do to help prevent or reduce the symptoms. These include using a humidifier to moisten the air, stopping smoking, taking regular breaks from looking at the computer and eating a healthy diet that includes omega-3 and omega-7 fats. As with any physical symptom which is causing you irritation, we always recommend speaking to your doctor before changing your habits or medication.